This review will contain spoilers for Daredevil #36 so proceed with caution if you haven’t read the issue! Okay, wow! This issue was quite the thrill ride. While the destination was known to most readers who’ve kept up with the news – that Matt Murdock would be forced to relocate to the west coast by the end of the issue – the details of how it would all unfold were not. 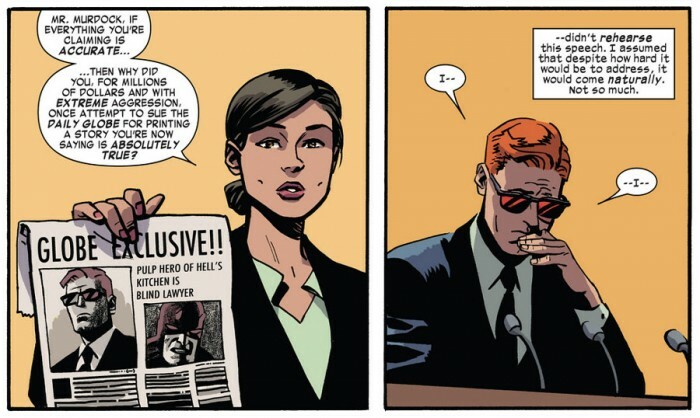 Sure, the cliffhanger at the end of Daredevil #35 gave us some indication of how things would play out, but there were still lingering questions: Was Matt’s apparent confession to being Daredevil on the witness stand actually what it seemed? Would there be some kind of fake-out at the end? Would Matt’s identity as Daredevil now be officially known rather than just strongly suspected? And what would that mean in practice? From looking at fan reactions to Daredevil #36, it seems the end to volume three has been pretty universally praised. I agree with much of this praise, as you’ll see below. However, there were key moments in this issue that I must admit still have me scratching my head a bit. I’ll get to that too. 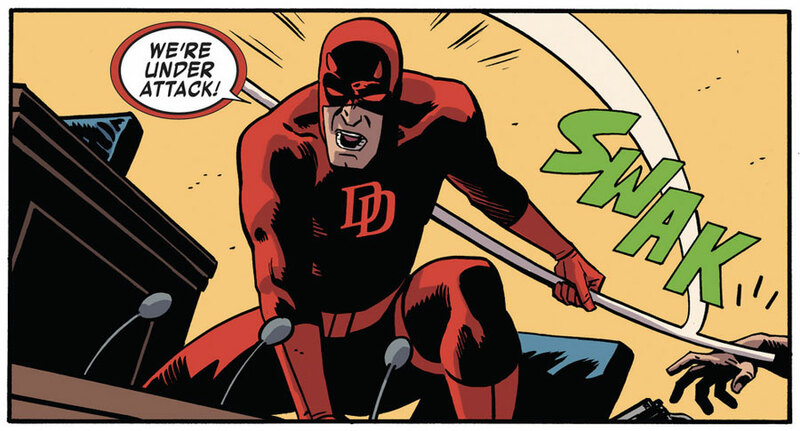 Overall, Daredevil #36 is a great issue. It’s beautiful, well crafted, perfectly paced. It’s great for many of the same reasons nearly every other issue of volume three has been great, and it clearly shows why this run has quickly become a favorite of longtime fans and new converts alike. However, what took this issue down a notch for me was that it didn’t, in my mind, adequately address the consequences of the events that were set in motion. Let’s start with the good. The art, as always is amazing. Chris Samnee somehow manages to continuously outdo himself. He inserts plenty of drama into an issue that, for all its action, contains an unusual number of talking heads. He spices up a courtroom scene by highlighting the tension brewing under the surface, and even the words themselves become become part of the artwork in that amazing page that sees “I AM DAREDEVIL” provide a window on the reactions of other key players in the Marvel Universe. Samnee is great at conveying the emotions of all the characters in this book, and his action scenes are always well- choreographed and easy to follow. Javier Rodríguez’s colors are also top-notch, as always. As for the individual scenes of this issue, the one between Matt and Foggy that starts it all off is a really strong one. It provides further insight into the relationship between the two and how Foggy views his own life, both in relation to Matt’s and in terms of how well it stands on its own merits. This conversation provides a very plausible backdrop to the decisions that Matt makes on the stand and addresses the consequences they will have for their practice and Foggy’s medical care. A while back, Mark Waid mentioned that he hadn’t quite figured out how to handle Matt’s relationship with Kirsten McDuffie. Over the last few issues, however, he seems to have figured out the right formula, and I love their interplay here. Kirsten is someone Matt can lean on both personally and professionally, and part of the reason she is able to provide such solid support is that she is not someone who will passively surrender to his will, but challenge him on many levels. The two of them have started a romantic relationship, but Kirsten has clearly avoided getting herself emotionally and psychologically sucked into the whirlwind that is Daredevil. She is willing to play her part in Matt’s apparent downfall, but has obviously voiced her own opinions on the matter, and is even the one to offer a solution to his problems at the end of the issue. Daredevil #36 also does a great job of tying up the loose ends of the Sons of the Serpent subplot. With Matt set to leave New York, we all know he wouldn’t want to leave the justice system he has been a part of for so long in a corrupted state. But, in order to expose the Serpents’ reign of terror, he has to pay a very steep price by making their hold over him worthless and beating them to the punch. Matt’s conflict with the Sons of the Serpent has forced him to examine his own ideals, and here it is his personal integrity that wins out, even when it comes at great risk to himself. This, more than anything, shows Mark Waid’s firm grasp of the core values of Matt Murdock. The magnitude of the events of Daredevil #36 cannot be understated. Matt has had his secret identity revealed before, most recently at the hands of Brian Michael Bendis and Alex Maleev during the beginning of their run on Daredevil. What made Daredevil’s most recent outing stand out from the rest, and compared to some other Marvel characters, was that it was never completely undone. Ed Brubaker and Michael Lark managed to repair the status quo enough so that it allowed for other kinds of stories to be told, but the cat never did find itself completely back in the bag. In Daredevil #36 Matt publicly admits that he is Daredevil, and he does so while under oath. The cat ran off and someone torched the bag. This is it. And this is huge. Which is what makes what happens next seem relatively inconsequential. Yes, Matt does get disbarred – as does Foggy – and he does find himself in a major bind as far as his and his partner’s futures are concerned, but considering what he just confessed to, this is a slap on the wrist. To be honest, I was doubtful that Waid & Co. would actually let Matt get himself into this much trouble precisely because of what the consequences would be. I was also surprised to see Matt’s old law suit against the newspaper that outed him be brought up in this way. We see Matt apologizing for it, but we’re skirting the major issue here which is that Matt sued the Globe for millions of dollars and won. If I were legal counsel for the Globe, I’d get ready to go after Matt in five seconds flat. Matt confessing to being Daredevil also opens him up for the criminal charges which Daredevil should be facing following Shadowland, along with a long string of other legally questionable things that Daredevil has done over the years. And what about all the criminals Nelson & Murdock have put away that have had even the slightest hint of Daredevil involvement? Instead, we see none of this (at least at this point) and even the people presiding over Matt’s ethics committee hearing seem regretful, almost apologetic. They shouldn’t be. We fans love Matt Murdock and get what Daredevil is about, but there is simply no way around the fact that being Daredevil is highly illegal and that Matt’s history of acting on both sides of the law is unethical. That Matt sees himself forced to move to California is such a minor consequence of such a major plot development that it makes this issue, for all its undeniable merits, seem a little off-kilter to me. I’ve seen this issue referred to as the perfect ending to this chapter of Daredevil. I would disagree for some of the reasons mentioned. I will say this though: The last couple of pages were the perfect beginning of the next chapter. I love the idea of taking Matt to San Francisco, and I love that he’s going with Kirsten and Foggy at his side. I foresee a great future for this creative team in bringing their concepts and storytelling prowess to a new volume of Daredevil. It remains to be seen just if and how Matt will be haunted by his decision down the line, but for now, I’m perfectly content to see Matt try to build a new life for himself in his civilian guise, and as Daredevil. And, as you all know, we’ll only have to wait a few days for the first episode of the digital series Daredevil: Road Warrior which premieres on Tuesday. I will definitely check back with you then, and probably sooner! As always, please leave your comments below! I’d love to hear your thoughts on this issues. Daredevil gets a new billy club! Agreed on almost every point. Such a great issue in so many ways, but while reading it the part of my brain that cares about continuity and character history was screaming. The phrasing in the issue about the lawsuit was interesting. “Why did you once ATTEMPT to sue?” I was also under the impression they DID sue and WIN, and thats how Matt got so much money that he and Milla put back into Hell’s Kitchen to better the neighborhood. Smells of a retcon. Maybe the thought behind Matt not being immediately arrested is that the D.A. (who owes Matt his life) won’t go after him for prosecution. Thats a huge stretch of believability though. I can forgive this and the above problem. What I can’t get past though is, at least for now, ignoring the unavoidable repercussion of every case Matt and Foggy have ever worked should now be in the toilet. God knows how many criminals should now be back on the street. Also Matt should not be able to walk down the street without being bombarded with court summons in the countless lawsuits that should be coming his way. Maybe Mr. Waid will address this. I sincerely hope he does and not in a way so as it is wrapped up easily as it appears to have been in this issue. Also, I know Waid has avoided using Kingpin and I applaud him for it, but how do they not include a reaction shot of Fisk watching Murdock on the news. I agree the continuity seems to be taking a backseat and retcon’d so Marvel can make DD move out west. Matt may have left the judicial system clean of any serpents, but Hell’s Kitchen is free game now that the bad guys, super bad guys, and Super villains know DD is in San Fran. Puttting a new stamp on a series seems to be the nature of the beast, in comics, whenever a new creator starts a long run on a well known character. Especially a well crafted run, like Waid’s and Co. on DD. So maybe we have to take continuity with a grain of salt once Waid’s run began and move forward with DD’s recent / new continuity…make any sense? I dunno, but that’s comics continuity for ya. See yous guys in San Fran! Despite the problems, I have to say that this is only the second comic to bring tears to my eyes (the first was about 25 years ago. New Mutants, when Wolfsbane was in the Danger Room trying to find ways she could have saved Cypher’s life). I think it’s a vigorous and heartfelt review as always. 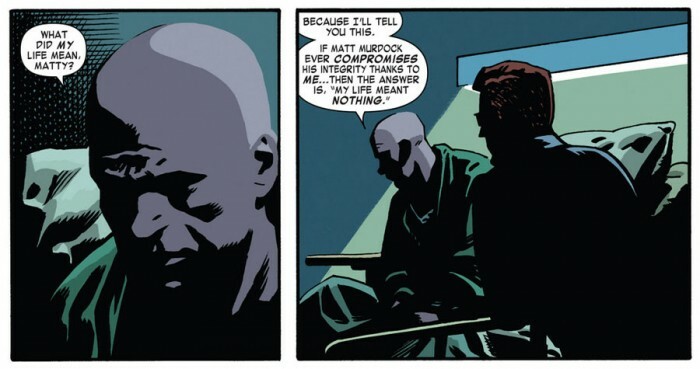 Waid’s execution doesn’t bother me, because it does not immediately denote an absence or lack of insight. I think his confession is so monumental it’ll take years to process even the beginning of the ramifications. Focusing on the smaller problems (which is funny to say given how intrenched the Sons of the Serpent were in the New York justice system) is the sane course for the short term. In every series we’re dealing with the accumulated history and then the month to month. I’d say it’ll be a while before we can position what Waid and company are playing at (even they may not know the full extent yet.) Ending with a small but significant victory will probably make the bitter pill of consequences to follow a bit more proportional. The justices’ reactions feel pretty tame in the Marvel Universe. The can’t condone Daredevil’s presence but that also can’t ignore that he remedied a system that was too corrupt to function and would invalidate their our authority. A delicate line but handled with grace I think. I little off-topic here, but I just wanted to recommend She-Hulk #1 to Daredevil fans. Very similar (lawyer, New York, known to be a superhero). Plus it has a vibe that sits somewhere between Waid’s Daredevil and Fraction’s Hawkeye. Back to the issue, I loved the issue but absolutely agree with Christine. After finishing #35, the first thing I though of was an image of Ryker’s Island’s doors flooding open. I wonder what is going to happen to Foggy? Is he going to be relocating to San Fran in his state? I don’t know if he went with Matt last time, but if not it seems like could be barriers to his practicing in San Fran. Maybe he’ll even be left out of the comics for a few years. She-Hulk was great! I’m slowly getting into Marvel (as DC has slowly lost me as a reader. Truth is, Mark Waid’s Daredevil run has had a lot to do with it. I’d gradually forgotten that I used to find comics FUN instead of just ‘okay’ or ‘inspiration for fanfic’. Then I tried DD on a lark, when my pull-list for the week was thin. Picked up #18 and I’ve been along for the ride ever since. And buying back issues on Comixology and just joined Marvel Unlimited. Anyhoo…) and gave her a shot. Now she’s on my subscription list. To answer your question, unless Mark Waid has a habit of lying in interviews, Foggy IS going to San Fran. Waid confirmed it, saying he didn’t want to break up the bromance. Kirsten is iffy, but Foggy’s a lock. Well, Kirsten is the one who will help him get to San Francisco so I assume she will stick around. Foggy is dependent on Matt both emotionally, physically and financial at this point. It wouldn’t surprise me to see Matt and Foggy move in together actually. Thanks for the (mostly) positive feedback, everyone. FWIW, we will be addressing some of the further ramifications in the upcoming series, but c’mon, guys–we had 20 pages. And, yes, in the real world outside your window, the judiciary board might not have been so lenient, but if you can buy that radioactive waste gives a kid the ability to read with his fingertips, this doesn’t seem so huge a stretch. YMMV. And as for the worry that this would have somehow retroactively overturned all Matt & Foggy’s cases, the experienced court lawyers I’ve spoken to say (a) no, and (b) this might mean that a bunch of Matt & Foggy-prosecuted villains might be able to reopen their cases ONLY if Matt & Foggy were prosecuting attorneys. But they’re not. They’re defense attorneys. Thanks for the kind words. Hope you’ll give us the benefit of the doubt on repercussions–I think our track record so far has been pretty good about showing Matt having to address the consequences of his past actions, which has pretty much been the running theme. Why stop now? Man, how great for Christine that Mark Waid himself has something to say. I do not like re-numbering but, to me, Mark Waid and Chris Samnee are worth paying $3.99 for. More importantly, I am so glad that the magazine ‘Daredevil : The man without fear!’ will celebrate its 50th anniversary in april 2014. Thank you so much Wild Bill Everett and Stan THE MAN Lee for launching this MARVELOUS comic book character’s ongoing series with Daredevil : The man without fear!’ issue 1 cover dated April 1964. Thank you Wallace Wood for the red costume. Just wanted to swing by and thank Mark Waid himself for commenting! So, don’t stop now; I can’t wait to see what you guys have in store for us! I have full faith that Mr Waid has thought this through more than I have as far a repercussions go, and I look forward to the continuing story. This whole issue, as good as it was, and it was very good, just had a rushed feeling. Like they were in a hurry to wrap up and get to San Francisco for the re-launch. My phrasing was not great in my above post. I think two ideas got merged into one. I know Matt and Foggy aren’t prosecutors. As far as criminals going free, I just picture an army of lawyers lining up to talk to every person who is in prison because of Daredevil’s actions looking for the slightest reason to overturn the conviction or sue now that they have a definite target to point to. I hope Marvel puts the 1970s DD-in-San Francisco issues in its online store. Would love to read them before the next ish comes out. My two cents as to why the Globe may not be coming after Matt…at least, not yet. Let’s not forget that the owner of the Globe, Mr. Rosenthal, had his head separated from his body in issue 42 of Volume 2. And, given the state of mega-media mergers in the US today, perhaps some big conglomerate bought out the Globe from Rosenthal’s widow and the current ownership have no interest in filing a new lawsuit. As Mark W. said earlier, if you can buy the chemicals/blindness/senses business, this is as good an explanation as any. Or at least until Mark proves this theory entirely wrong! By the way Mr. Waid, it was a pleasure meeting you at the Baltimore Con last September, and I eagerly await what you have in store for Matt, Foggy and Kirsten in San Francisco. By the way, great touch with Matt’s airline ticket: StanAir Flight #1964. Was it just me or did the last two pages seem like a nice call back to the first issue of this volume? What with Kirsten coming to speak with Matt on the roof, and then him taking her in his arms reminded me of when he stole that kiss from the mob bride! It was probably unintentional, but I thought it made for a cool bookend to the run. Loved the issue. And can’t wait to see what Waid and Samnee have in store for us with the next volume. Bring it! – Oh, and with this issue I counted Samnee’s 10th use of the Matt’s shadow = Daredevil’s silhouette trick. That’s 10 out of his 19 issues (not counting the cover to issue #16). I can’t be the only one who gets a kick out of spotting these! Great issue, I was actually surprised by the ending!! That seems to never happen in comics anymore! I think that with DD’s secret identity kind of being out for so many years, this was the only way for that story to end. As long as he doesn’t make a deal with Mephesto to put the genie back in the bottle 😉 Also Christine, it was cool to see your website written on one of the boxes on the front cover of the issue! I liked the details of including previous writers and artists on the cover as well, the only notable person I couldn’t find was Nocenti, did anyone see her name? Cant wait for issue #1! Thanks to Mark Waid for the response but one thing bothers me. Foggy DID work as a DA for a time. WE know that he didn’t find out until after he stopped being a DA but won’t some of the people he put away try to argue that he knew all along, despite his claims to the contrary? There are a lot of us. And we don’t all wear masks these days. Iron Man went public. So did Captain America. Others. Probably because it’s harder to keep secrets in an internet surveillance age. But I think some of it, too, is that the ethical paradox can wear you down. No one on the white-hat side has ever hidden his or her identity with less than noble intent: to make the fight about something bigger than us. To represent a greater justice, where the focus can be on right and wrong, and not on whether the bad guys will exact reprisal on those close to us. And sometimes you have to lie. Sometimes, someone guesses — ‘Aren’t you really Spider-Man? — And you look them dead in the eye and say ‘Absolutely not’ because you can justify a lie if lives are riding on it. Even as you fight for, as the saying goes, truth and justice…even if you’re a lawyer who has sworn to live by the truth, you willingly bear false witness. When The Globe came after me, I lied to shield my friends. That’s the truth. It’s not the kind of excuse I’m looking forward to giving St. Peter — and a sin is a sin — but maybe he’ll understand. I hope so. But where I took it too far was in counter-attacking The Globe. That wasn’t me shielding anyone or dismissing a perceived danger. That wasn’t an act of integrity. That was me fighting to preserve a lie. Keep it alive. Give it power. So it only took about 12 years in real-world time for Matt to understand the point Luke was trying to get across to him. How long was it in Marvel-time, do you think? Thanks Coff! Now I know how time-space continuum works! I really felt a need to add my comments to the pile here, and hope no one finds me too long winded. I have never been to New York City but I have lived in Chicago, and governments/police/courts in such large American cities can have amazing levels of corruption. The former Mayor Daley of Chicago once destroyed an airport in a manner completely against the law and the city received a fine of only a few tens of thousands of dollars and Daley himself suffered no personal consequences, as just one real life example of someone favored by city government getting away with a crime. If the administration of a large city like New York looks on someone favorably they may not be charged for years, perhaps never. Matt may have rooted out the Serpents, he didn’t cure corruption entirely and indeed some of that corruption might actually favor him, not because he wants it to but because the people in power would rather not put him on trial for whatever reason. Daredevil is privy to a lot of nastiness, maybe some in power are afraid that by putting him on trial their own misdeeds might be revealed. The DA owes his lived to Matt/Daredevil, perhaps he doesn’t want to repay that debt by putting Matt on trial or in jail. Also – for some reason the superheros in the Marvel universe are seldom if ever brought up on charges. Have to wonder if there’s some sort of legal immunity or something we haven’t heard about. As Matt says – he kept his two identities secret for years to protect not just himself but those close to him. That only works as long as it stays completely secret. That was no longer the case. He revealed his identity publicly not only for his own benefit, but also for those around him. He kept a secret to save lives, he is revealing a secret to save lives. That, really, is one of his core ethics and that has never changed – he errs on the side of life whenever possible. That he gets buy-in from both Foggy and Kirsten, the two people most impacted by this other than himself, shows that whatever the faults of Matt Murdock he no more stops trying to do the right thing than he stops fighting the good fight.